It’s no surprise that I am a huge fan of the USO. 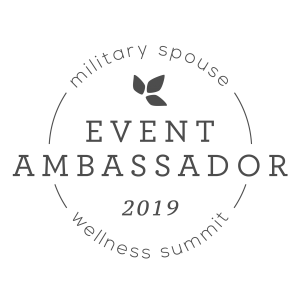 I have been a volunteer with the NC chapter for over four years and have seen both as a volunteer and as a military spouse the many ways this organization assists and uplifts military families. 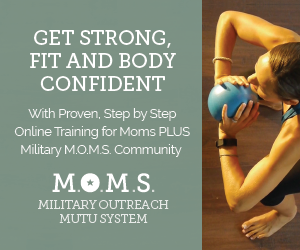 On November 14, 2018, the USO put together an amazing lineup of speakers to highlight the challenges, strengths, and achievements of the military spouse community in their Salute to Military Spouses Summit in Washington, DC. For those, like me, who were not able to travel to DC, we were able to attend through the live stream on the USO’s Facebook page. I am so glad I did not miss this event. 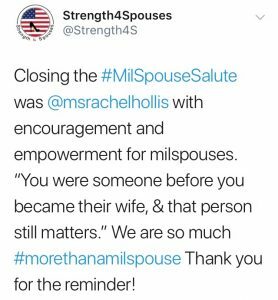 It was packed full of empowerment, calls to action, and positive strides made in the military spouse community. I literally took eight pages of notes, so that I could share some important information for those unable to attend. Below are a few of my favorite highlights from this amazing summit. Chris Marvin, lead researcher for “The Backbone of Our Military,” presented three key common themes of importance to military spouses in the findings of the extensive qualitative research process. 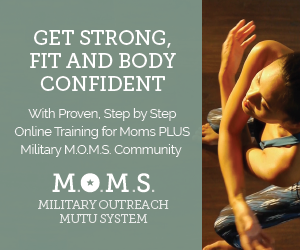 Click here to view the Military Spouse Report Snapshot. On this panel was Jacqueline Klimas, Politico’s National Security Reporter, Chris Cortez with Microsoft’s Military affairs, Liza Rodewald, CEO and Founder of Madskills, and Eddy Mentzer who is the associate Director for Child, Youth and Families, Office of the Deputy Assistant Secretary of Defense. To learn more about Microsoft’s training programs for military spouses, click here. Google weighed in on this discussion and explained their programs to help military spouses train and begin a career in IT Support. For more information on that, please click here. The biggest takeaway from this panel was the wealth of information about financial laws that protect service members explained by Carole Reynolds, Senior Attorney, Division of Financial Practices, Federal Trade Commission. If there is a replay available, this is an area to pay special attention to. First of all, I want to give a shout out to Amy Bushatz, Executive Editor for Military.com for being such a wonderful host throughout the entire event. She was positive, lively, personable, and a great storyteller. 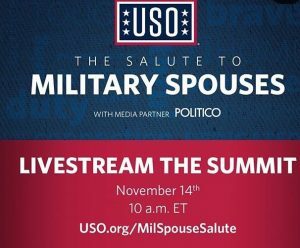 Also, my utmost gratitude goes to USO for putting on this event and streaming it live, so those of us unable to travel to DC could still be a part of this summit. The research, data presented, and wealth of knowledge by all the speakers was impactful. 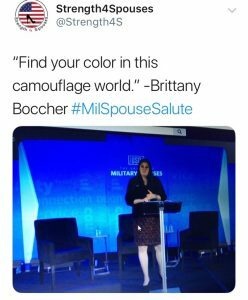 There were some great points made about military spouse employment and calls to action to help military spouses gain a meaningful career that pays them what they are worth. Now, I challenge anyone reading this to give military spouses a fair chance for employment. It is one thing to utter the words, but another to take action and mean what you say. 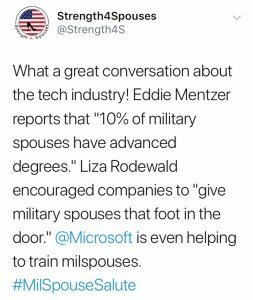 I was happy to see big companies like Microsoft and Google take aim at helping the military unemployment crisis by providing training programs. My only hope is that other companies will follow suit and realize the value in hiring military spouses. Providing a remote option for employment, not only helps us with longevity at a company as we move around the world, but also allows us to the opportunity to have it all. 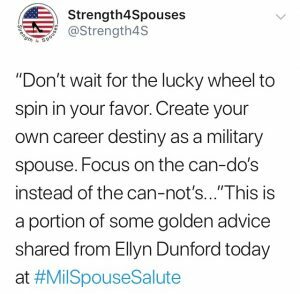 It’s not uncommon for military spouses to have to choose between career and family, but working virtually helps us to eliminate this devastating decision. Lastly, there is nothing worse than looking at a hard-earned degree hanging up on the wall that you aren’t using, just because you cannot seem to get that “foot in the door.” I appreciate that Liza Rodewald so fiercely made this call to action and hope others will take it to heart. To Rachel Hollis, who brought in powerful closing remarks, thank you for taking the time to share your wisdom with us. Although I haven’t read your book yet, but see it plastered everywhere I look, I can now fully understand the reason why you are the New York Times #1 Best Selling Author. You are one powerful and magnetic lady! Thank you once again to the USO for providing such an enlightening and empowering summit. My hope is that you will make this a yearly occurrence, so we can compare data from year to year and keep these important conversations, plans, and actions going. Wendi Iacobello has been an Army wife for three years and part of military life for five years. She spent nine years as an adult educator, prior to becoming a military spouse. She has a Master of Arts in Educational Media and a Bachelor of Science in Early Childhood Education. 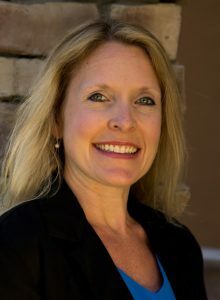 Her teaching career includes; Middle and High School Special Education, Correctional Education, and Community College Instruction in Early Childhood Education, Compensatory Ed, as well as Adult Basic Education. Currently, she is a blogger, freelance writer, instructional designer, and avid volunteer. In her free time, you can usually find her volunteering at USO of NC’s story time, outdoors in the garden, running, cooking up a new recipe, or playing fetch with their adorable Beagle, Daizi. Wendi is extremely passionate about helping others find their inner strength by sharing her experiences, insight, resources, and inspirational stories on her blog Strength4Spouses. What an encouraging recap. As a milspouse who has a bachelor degree and works in tech, I’d say this post is spot on. It sounds like there was a lot of good advice at the conference. I see a big push for remote work outside of military spouse hires as well. I think there are a lot more options for milspouses to keep pursuing their careers in between PCS season with the upward trend in remote work enabled by technology. Thank you so much for reading this recap. I’m super exited about the direction of things and this Summit was extremely empowering. I truly hope companies will make more jobs remote-which is a perfect fit for military spouses. Best wishes to you in your career endeavors too!